(Also known as Flower of Kent). Every school pupil knows that Sir Isaac Newton had the inspiration for his theory of gravity whilst sitting under an apple tree and pondering why apples fall. This lovely story, which was related by Newton himself to several correspondents, occurred in the summer of 1666 - about 350 years ago. What is perhaps less well-known is that the variety of apple which the famous scientist saw falling from the tree has been positively identified. The incident is known to have taken place in his garden at Woolsthorpe Manor in Lincolnshire - and fortunately there was only one apple tree in the garden. It was subsequently identified as a very old English variety (not surprisingly) called Flower of Kent. Even more remarkably, this apple tree, which must surely be the most important in the history of science, is still alive! The tree appears to have blown over several times in its life, but each time has re-grown from the roots. As might be expected of a variety from this period, Flower of Kent is a large sharp-tasting cooking apple with juicy crisp flesh. Many cuttings have since been taken from the famous scientist's tree, and it is a popular variety in the grounds of university physics departments around the world. Please fill in the details below and we will let you know when Isaac Newton apple trees are back in stock. Isaac Newton is in flowering group 5. Isaac Newton is self-sterile and needs to be pollinated by another tree of a different variety nearby. Sir Isaac Newton's tree - Flower of Kent - is unusually late-flowering, so is a useful variety in areas subject to late spring frosts. 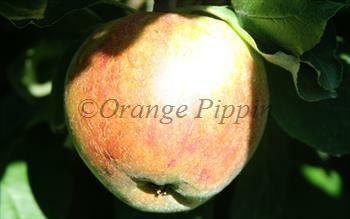 Flower of Kent is an old English culinary apple variety, dating back to the early 17th century.